I turned, with my phone held to my ear, and saw a young woman, who was maybe 20, standing at the kerb of the crossing next to me. Between her lips she nursed a cigarette, tendrils of smoke floating in my direction. I glanced back at the young woman and saw the glowing tip swinging in her fingers as she walked. So casual. So oblivious. And I had a sudden image of my four-year-old daughter switching places in 16 years, and I felt a pang of guilt for being so judgemental. The most addictive element of tobacco: nicotine—which, according to The American Heart Association, is at least as hard to quit as heroin—stimulates our brain’s reward system. It takes less than 20 seconds after inhaling tobacco for nicotine to enter the bloodstream and cross the blood-brain barrier, delivering an almost instant hit. But cigarettes don’t just contain nicotine. They also contain over 4000 other chemicals, more than 60 of which have been identified as carcinogens. The big four diseases that smoking causes are lung cancer, emphysema, heart disease and stroke. But it is also known to cause 18 other cancers, including head and neck and bladder cancer. Thankfully—due in part to anti-smoking campaigns, plain packaging laws and tax increases—smoking rates in Australia, as well as other developed countries, have been steadily falling over the past two decades. Figures from the Australian Bureau of Statistics show that one in seven Australian adults were smokers in 2015, compared with one in four 20 years ago; however, this downward trend may be plateauing. King is all too familiar with the human cost of tobacco. As a clin­ician, she has stood at the bedside witnessing the pain of teenage children saying goodbye to their 43-year-old mother who was dying of lung cancer. King has been lobbying hard to hit tobacco companies where it hurts most: the profit margin. It all began in 2010 when she discovered that her superannuation fund, Health Super, was—despite its name—investing money in big tobacco companies such as Phillip Morris and British American Tobacco. The best time to raise the subject of quitting is when people experience a critical event. It was the start of a two-year process involving multiple meetings and discussions that culminated in the first of many victories for King. The fund, which was acquired by First State Super during the negotiations, became the first superannuation provider in Australia to divest its $200 million worth of shares in tobacco. King founded the not-for-profit organisation Tobacco Free Portfolios and spent what little free time she had on her phone and on her laptop, spreading her message. Meetings with finance directors or investment managers often had a snowball effect. Convincing board members one at a time, she would not give up until the welcome email from a CEO had come through, announcing that their portfolio was now tobacco free. At last count, her organisation has convinced 41 out of the 344 non-self-managed super funds in Australia to divest from tobacco. In 2016, the world’s third largest insurer, France’s AXA Group, announced it would relinquish its €1.8 billion worth of tobacco stock following six years of campaigning by King. In December 2017, The BT Financial group went tobacco free. Australian Super, Telstra Super and OP Trust, a large Canadian pension fund, have all dropped tobacco. And at the United Nations Office at Geneva, King and her team were on site to witness the CEO of BNP Paribas—the world’s seventh largest bank—announce that his organisation was now tobacco free. Closer to home, she urges all of us to be good role models for our children. “Keep the communication channels open and talk about the dangers of smoking,” she said. “And try to get your children involved in sport, because I think that kids who are committed to a sport become focused on health and strength and fitness. 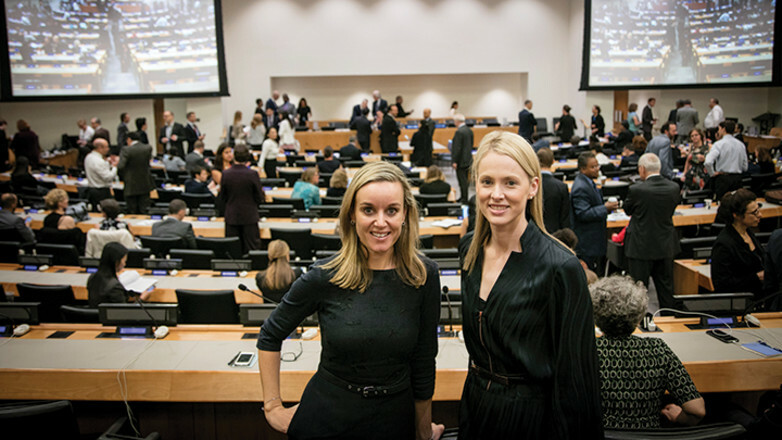 Dr Bronwyn King (right, Tobacco Free Portfolios CEO) and Clare Payne (Tobacco Free Portfolios chief of global strategy) at a United Nations Environment Program Finance Initiative event at UN headquarters. I looked down at my daughter and kissed her. I pressed her sweet-smelling hair to my cheek and whispered a silent prayer of thanks for King, and the work she is doing on behalf of our children to make the world a healthier place. World No Tobacco Day is on May 31. More info from the Lung Foundation Australia’s website at LungFoundation.com.au or NZ’s Health Promotion Agency website: hpa.org.nz. More information about Tobacco Free Portfolios can be found at http://www.tobaccofreeportfolios.org.